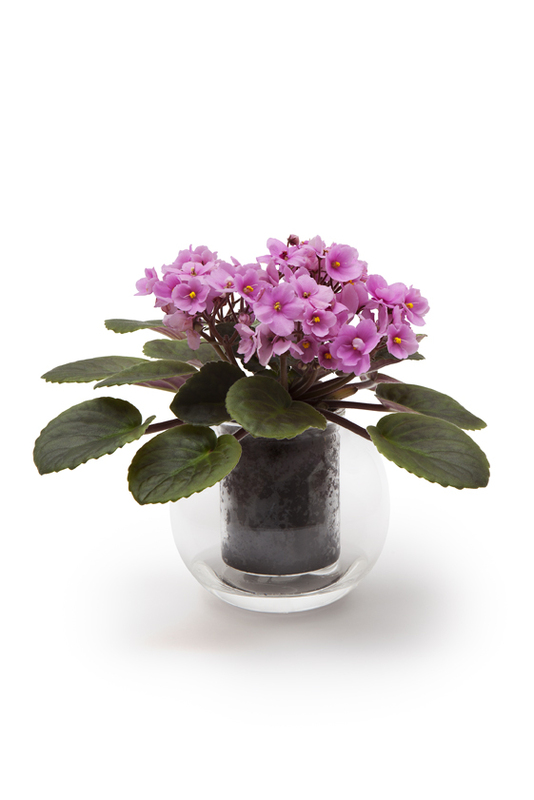 African Violets are one of our CUP O FLORA's best-selling plants. They are perfect for windowsills or areas with lots of natural light. They have beautiful flowers and cool leaves. Light: Lots of natural light but no direct sun. What to look out for: The plant will reward you with a beautiful flower if given enough light and care. After a while, the plant may outgrow the pot and will need to be re-potted. Insert the wick into the new pot and fill a third of the insert with African Violet soil. Extract the overgrown plant with the soil and use your fingers to remove any leftover soil. Position the plant in the centre of the insert and cover the roots with more soil. Compact the soil and eliminate air pockets by gently tapping the insert on the table (use a cloth to ensure the glass is not damaged). Sagging or yellowing leaves: Make sure you follow the watering regime. Some leaves will dry or sag naturally and can be cut using a pair of scissors. Leaving 20-25 leaves will ensure that the plant can produce enough energy and generate new flowers.